IHG® Rewards Club - eBooks - B.I.B.L.E. In this world, there is hope.Are you looking for that one thing that will give you hope? Where, in this world we live in, can we find hope? Why is it hard to find hope? Why is that? Hope comes from God and through his words. This story shows that hope for the simple man is still possible, no matter where in life you happen to be. 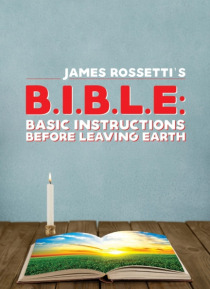 James Rossetti, a simple working man, found reading the Bible daily … and contemplating the Holy Scriptures have raised that hope through Jesus Christ, a true worthy friend that will always be there for you, cheering you on, there to pick you up when you have fallen.Trust in the Lord with all your heart, and do not rely on your own insight. In all your ways acknowledge him and he will make straight your paths. Proverbs 3:56Wherever you are in life, my hope with my story is to bring you one step closer to what God is asking us to do, which is to live our lives with hope, love, mercy, and humility. Our Lord is a forgiving Lord. He is inviting us to his table. Now is the best time to start finding and living that hope. We all have this inside of our hearts. We just need to open up to our Lord and let him show us where and how.